The large cement block building, pictured in 1910, was erected by Hugh Agner in 1909 on the north side of Chestnut Street near the intersection with Dodge Street for his automobile business. The building replaced a wooden structure that Richard Weygand had built in 1877 as a paint shop. Agner had entered the automobile business early in 1908, forming a partnership with Harry Reynolds, under the name Star Garage. They rented the Weygand building to do repairs and handle Jackson automobiles. Later that year, Agner bought out Reynolds’ interest in the business; purchased the Weygand property and sold the wooden building, which was moved off the property; and put up the cement block building for a garage and machine shop. He named his business Guarantee Auto Company. Agner became a Buick agent and later added Studebaker, Flanders, Maxwell, and other makes. In 1912 Agner built a one-story office building on the Dodge Street side, and in 1915 he built an addition to be used for storage. Brothers John and Arthur Cunningham bought the property from Agner in 1916 and, after Agner moved his business to a new building on Geneva Street (now Milwaukee Avenue), took possession in January 1917. The Cunningham brothers, who handled Buick and Overland cars, stayed in the building until July 1927. Runkel-Newell, Inc., which had the agency for Dodge and Hudson-Essex automobiles, leased the building from the Cunningham brothers, taking possession in November 1927. In January 1929, Runkel-Newell took over the Studebaker agency from Hugh Agner and discontinued its Dodge agency. 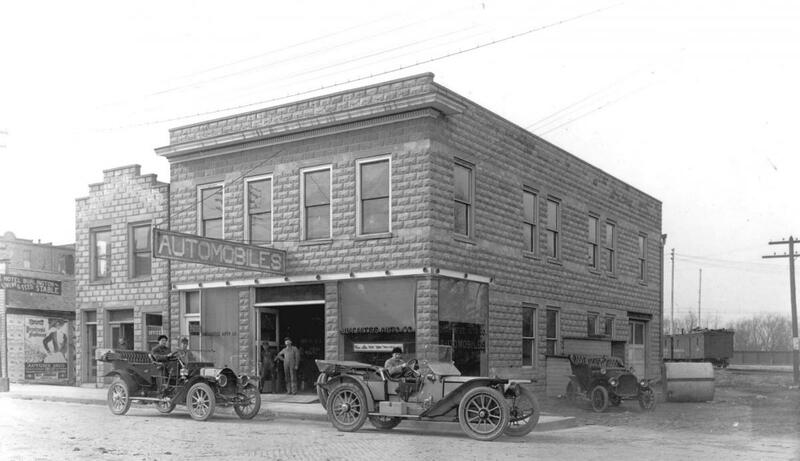 After Runkel-Newell moved its business, renamed Champion Motor Co., to a new building directly across Chestnut Street in 1929, Cunningham Buick Co. remodeled the cement block building for use as its used car show room. In 1931, Arthur Cunningham bought the building from Cunningham Buick Co., and leased it out to various businesses, including a dry cleaner, a gasoline station, a pet shop, a watch repair shop, and a radio store. In 1936 Leland Koch leased the building for his farm implement business, which remained there until 1949. Harold Topel then leased the building for his Nash automobile sales and service garage, which operated there until October 1956. The Reineman Hardware Co. then moved its plumbing, heating, sheet metal, and air conditioning businesses into the building. In 1974 Reineman did an extensive face-lifting on the front of the building. In 1981, after Reineman moved its businesses out, Richard Colano opened his RC Motorcycle Co. in the building, remaining there until 1986, when Video Country moved into the building. After Video Country went out of business, Judie Lemieux opened her Chocolate Expressions shop in the building in December 2006. The recent photo, taken in October 2011, shows the cement blocks still much in evidence on the east side of the building facing the railroad tracks. Sharing the building with Chocolate Expressions is the Security Finance office. After John G. Rose, who had bought a bakery business in Burlington in 1888, built the “medallioned” building at the left in 1895 to house his business, it remained as “Rose’s Bakery” for nearly 80 years as John’s son, William, and grandson, Alex, and their families continued the business until 1973. The “Now” photo, taken in November 2011, shows little change in the appearance of the front of the building, except for the removal of the spindles, railing, posts, and date-plate that topped the cornice, shown in the “Then” photo taken in 1899. Occupants of the building after Rose’s Bakery closed have included the Realty Shoppe, Dr. Arnold Grossman=s optometry office, and the current occupant, Neighborhood Optometry LLC. John G. Rose also put up the large building next to his bakery in 1906 (as shown in the inscription at the top center of the building), leasing the first floor to William Rosenberg for Rosenberg’s dry goods and clothing store. The second floor contained an apartment and offices. 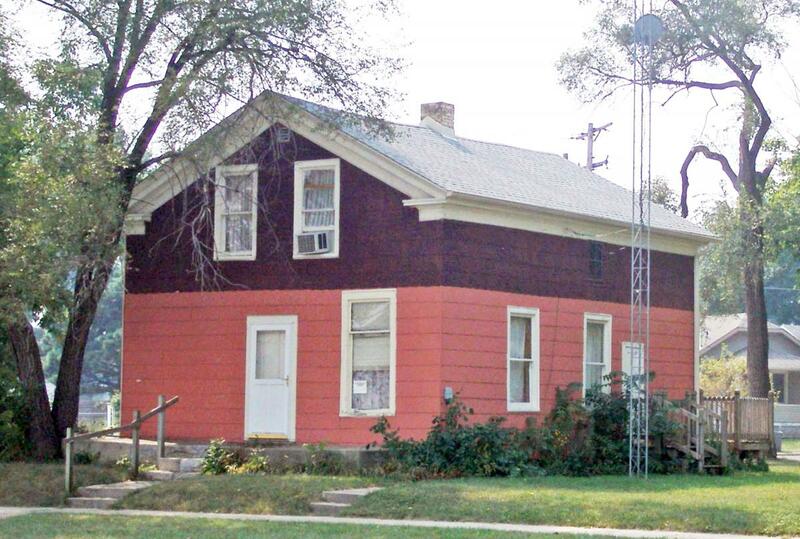 Rose had purchased the property with the two smaller buildings in 1894 from the Wendelin Miller estate. At the time of the 1899 photo, Frank Zwiebel’s Burlington Steam Laundry and Perley P. Armour’s harness shop occupied the buildings. After Armour went out of business in 1900, the Racine & Chicago Tea Co. opened a store in the former harness shop building. Both buildings were moved off the property to clear the site for the large Rose building. Rosenberg’s store occupied the Rose building until 1915, when it moved to the Keuper building on Pine Street now occupied by Schuette-Daniels Furniture Store. After Rosenberg’s moved, Rose leased part of the first floor of the large building to a tailor and opened a five and ten cents variety store in the remaining portion. After the tailor shop closed in 1916, Rose used the entire first floor for his variety store. In 1920 Rose sold the bakery business to his son, William; retired as a baker; and turned to helping his daughter, Cecilia, in the variety store. In 1939 Cecelia bought the Rose building from her parents’ estate and joined Butler Brothers’ Ben Franklin chain of variety stores as a franchiser. At that time, she was the only woman among that chain=s 400 franchisers. In 1943 Cecelia leased the building to the Kroger grocery store chain and closed the variety store. The Kroger store remained in the Rose building until 1949, when it moved to a new store building next to the Plaza Theatre. Following a short-term occupancy of the Rose building by a women’s clothing shop, the Atlantic & Pacific Tea Co. leased the building in 1952 and operated an A&P grocery store there until 1966. Since then, the building’s occupants have included a Western Auto store, a Goodwill budget store, the Bridal Suite shop and A Cut Above Hair Salon, Art Etc., and the current El Chava Super Market. The short building next to the Rose building, which now houses Michael Todd’s Cleaners, was built in 1951 by the George May estate, replacing the previous building, which had been put up in 1886. 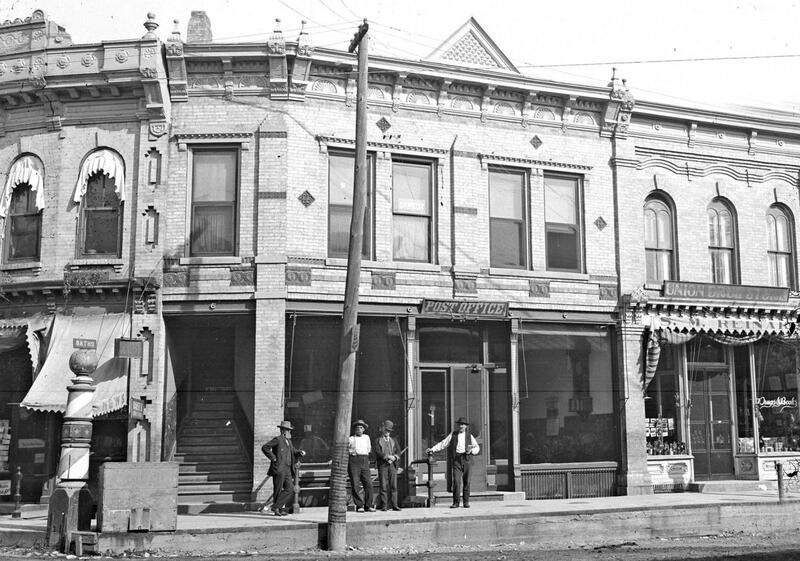 At the time of the 1899 photo, John Schneider’s jewelry store occupied the building. After Schneider vacated in September 1899, Charles Arnold moved his barber shop into the building, where it remained for 20 years. Businesses in the building after Arnold included an investment securities firm, a music store in which Stanley Szydlowski had an interest, an electric shop operated by Floyd McCormack and Louis Reuschlein, an automobile accessory store, two fruit and vegetable markets, and Joseph Suchy’s shoe repair shop. Since the new building was put up in 1951, its occupants have included Burlington Paint Court and Racine-Kenosha Bottled Gas Co., May’s Insurance Agency, Family Realty, Co-operative Credit Union, the Journal Times, Zero Gravity clothing store, Crossroads CDs and Tapes, Fancy Nails, Cool Nails, and now Michael Todd’s Cleaners. More than 100 years separate the Then and Now photos looking northwest on Lewis Street from the Conkey Street intersection toward the stone water tower at the top of the hill. Despite the time difference and some obvious changes, the scenes look remarkably the same. Trees lining the street are noticeably larger and the snow-covered unpaved streets in the circa 1905 Al-Vista panoramic photo (when there were few automobiles in Burlington) have given way to the snow-lined paved streets in the panorama taken a few days after the Groundhog Day blizzard of February 2011. 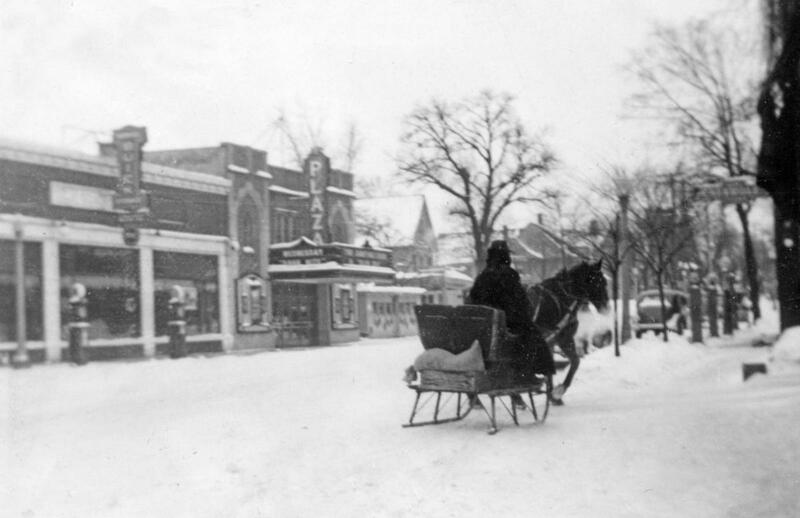 A single horse-drawn sleigh is the only conveyance seen in the early photo, while a mail truck and a few parked automobiles are visible in the recent photo. The house on the right corner at Conkey Street looks essentially the same in both photos, except for some remodeling and the addition at its right which is shown in the recent photo. The house, which was the home of Mrs. John Rasch at the time of the earlier photo, was purchased in 1945 by Fred and Elsie Oberg, owners of the Badger Hotel, as an investment. The house on the left corner of Conkey Street in the recent photo was built by the Joseph Hoffman family about 1934, while the one to its left was completed in 1911 by Bernard and Josephine David. The two houses at the right on Conkey Street in the c. 1905 photo have been supplanted by St. Charles Catholic Church, which was completed in 1910, and its parking lot / playground, which are shown in the recent photo. St. Charles parish bought the wooden house at the far right in 1909, turned it around, and moved it to a lot on Kendall Street where the parish’s red brick office building (formerly the Sister’s convent) at 440 Kendall Street sits today. The wooden house was used as the parish parsonage until 1922 when the brick parsonage at 456 Kendall Street was built. When the pastor, Rev. Philipp Dreis, moved to the new parsonage in 1922, the wooden house became the convent for the teaching Sisters of the Racine Dominican order who staffed St. Charles School. Until then, the Sisters, who had taught at the school since the parish began in 1910, had lived in one of the school rooms in the church building. The wooden house remained the convent until 1949, when it was torn down to make way for the brick convent building, now the office building. The house with the round bevel plate glass parlor window in the c. 1905 photo had been built in 1892 by Gustave and Mathilda Geheb Rasch. At that time, the window, about 6 feet in diameter, was something new in Burlington. Mr. Rasch, a prominent businessman with interests in the Burlington Blanket Company, the Multiscope & Film Company, and the Bank of Burlington, served as Burlington’s first mayor after Burlington became a city in 1900. After Mr. Rasch's death in 1932, Edward Hinchliffe bought the house and remodeled it into two flats. St. Charles parish bought the property in 1956 for use as a parking lot and playground. It sold the house to Harry Bigelow, Sr., who had it moved to a lot on Edward Street near Wainwright Avenue, where it sits today. Two wooden buildings, which were once located in Burlington’s downtown area and date from the post-Civil War period, now sit in locations some distance from their original sites. One, which served as Charles Arnold’s meat market and family residence at the time the left photo above was taken in 1874, is now a residence (shown at right above) on the corner of S. Pine Street and Wainwright Avenue, across Pine Street from Bob’s Pedal Pusher. 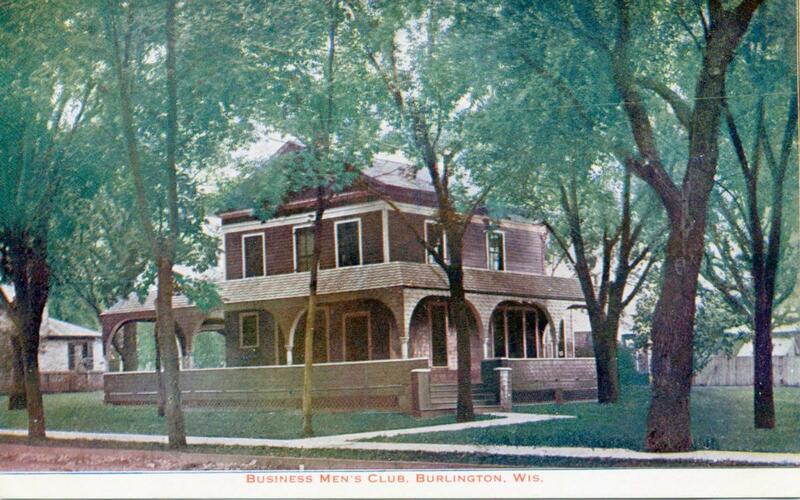 The other building (shown at left below) started out as the Pliny Perkins family’s residence on Geneva Street (now Milwaukee Avenue, where the parking lot in front of Reineman’s Hardware is located) and served as the clubhouse of the Burlington Business Men’s Association at the time of the circa 1910 postcard photo. The building is now the main portion of the Countryside Pub on Highway P near Bohner’s Lake (shown at right below). 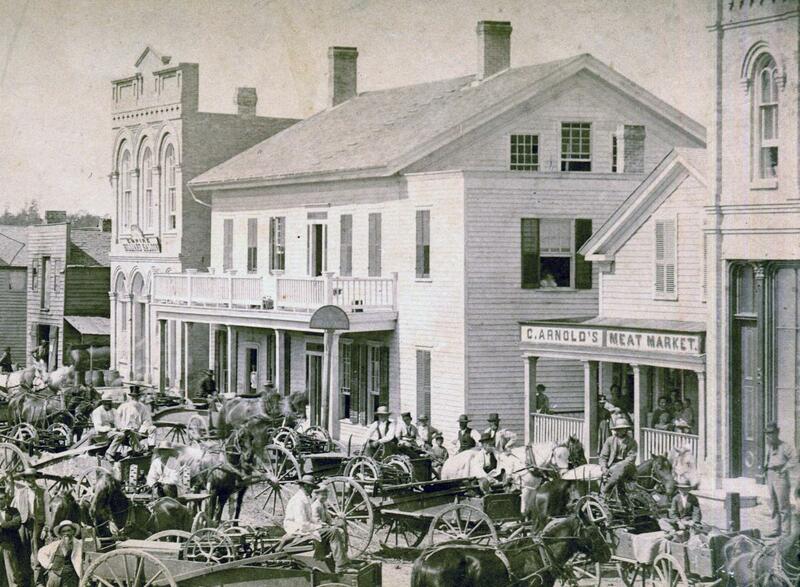 The 1874 photo showing Arnold’s Meat Market nestled between the large wooden Exchange House hotel (now the location of the Sci-Fi Café) and the brick Veteran Saloon building (the corner of which is visible at the right) was taken by Burlington photographer Adolph C. Moestue on May 30, 1874, after a load of reapers and mowers had been assembled in front of the Exchange House following a dinner in the hotel hosted by farm implement dealer William P. Goff. The machines had been delivered by railroad that day at the Western Union Railroad station (later the Chicago, Milwaukee, and St. Paul station) that stood west of McHenry Street near what is now Market Street. At the time of the 1874 photo, Louis Konst’s Empire Saloon and Billiard Hall occupied the tall brick building to the left of the Exchange House. That building, minus the arrow-topped cornice, is now the site of John’s Main Event. The Arnold’s Meat Market location is now the site of the Bankes building, which houses Bulletin Printing and Office Supplies. In 1897 Charles Beller bought the former meat market building from Francis Bankes & Son and had John DeGrave move it to a lot on the corner of Wainwright Avenue and Wilmot Avenue (now S. Pine Street), where it is shown in the recent photo. In 1909 George F. Jones, a Civil War veteran, bought the residence as a home for himself and his daughter and son-in-law, William and Lillian Jones Eddy. The house has since served as a home to various residents. The former Pliny and Ellen Conkey Perkins residence, shown in the circa 1910 postcard photo, was built shortly after the Civil War by Perkins, an early Burlington settler and business man. It was sold in 1886 to George H. Wilbur, founder of the Wilbur Lumber Co. After Wilbur moved to Milwaukee in 1893, it was occupied by Mr. and Mrs. Hugh G. Dardis until Robert G. Fraser, a partner of Charles B. McCanna in what became the Wisconsin Condensed Milk Co., bought the house in 1894 and remodeled it. After the Fraser family moved out, McCanna acquired the property and, in 1907, fitted the house up as a clubhouse for the Business Men’s Association. After the Association vacated the building in 1910, McCanna (who died in 1913) and his son, C. Roy McCanna, rented it to various tenants, including Samuel Jacobsen of the Burlington Brass Works, Mrs. Elsie Diener and daughters, and George Harper of the Brass Works. In 1939 the city council voted to buy the property from C. Roy McCanna for a city parking lot and advertised for bids to remove the house. Raymond Kiekenbush bought the building and, after demolishing parts of it, moved the main portion to the Kiekenbush farm on Highway P near Bohner’s Lake where he fitted it up for a tavern, which he and his wife, Greta, operated for many years. The building, with a number of additions and alterations, now serves as the Countryside Pub, as shown in a recent photo. 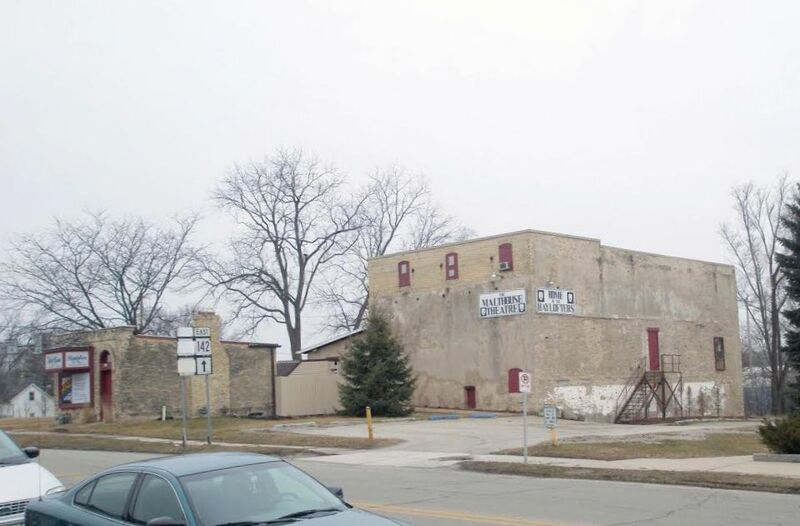 Some parts of the Burlington Malting Co. buildings on Main Street, shown in the Then photo (left) taken about 1898, are still recognizable in the Now photo (right) taken of the Malt House Theatre in February 2012. But other parts, including the tall smokestack in the center of the circa 1898 photo, the large building at the right, and the roof portion of the center building, are no longer seen. They were taken down at various times after 1943 when Burlington’s little theatre group, the Haylofters, bought the former malting company property at auction for back taxes. 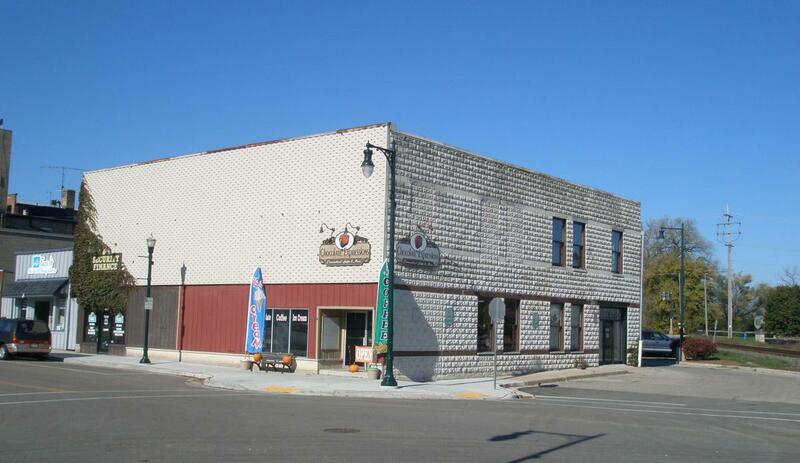 Muth added a malt house in 1868, and in 1870 turned his attention wholly to the malting business. In 1872 Muth replaced the frame building with the large three-story and basement brick and stone malt house shown at the right in the Then photo. During the 10-month season, he would malt 60 to 90 thousand bushels of barley, selling the malted barley to firms both near and far. In 1875, for example, a Louisville, Kentucky, firm ordered 1,800 bushels a month for the following 10 months. Muth’s business hit hard times, however, during the “Long Depression” that had started in Europe in 1873 with the collapse of a “housing bubble” caused by easy mortgages, and spread to the United States where railroad overbuilding and bank failures caused hard times that lasted into the mid-1890s. Muth sold the malt house property in 1877 to the People’s State Bank of Burlington, which itself ran into financial difficulties. 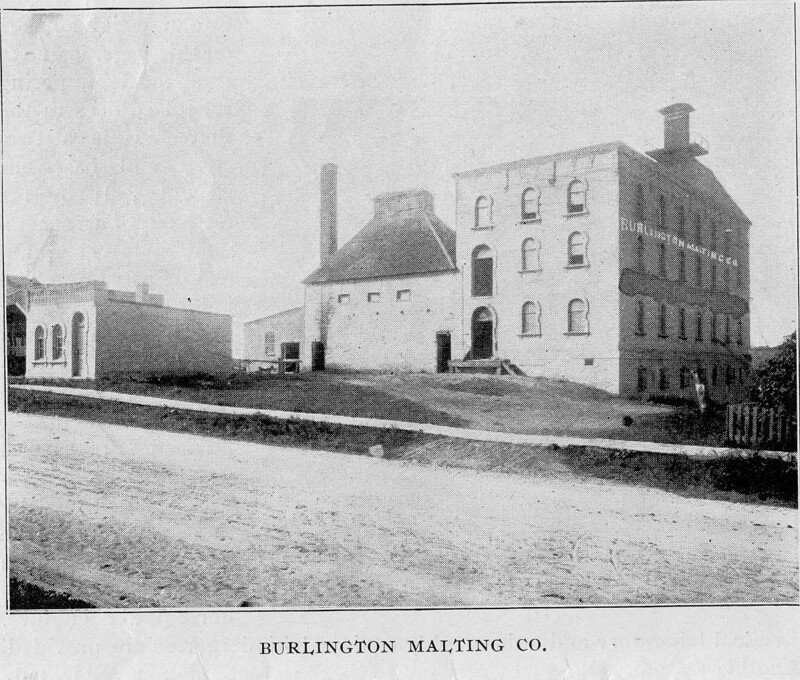 In 1879 the malt house property was bought at a sheriff’s sale by Racine banker Chauncy Hall and Burlington businessman Maurice Ayers, who resumed the malting business. In 1886 a stone engine room, with a smokestack about 50 feet high, was built at the malt house. The malting business went well for the Hall and Ayers firm, employing about six men during the annual 10-month seasons. In 1892 Mathias Petrie, who had been in the malting business in Chicago, leased the malt house and eventually bought it and the property from the Hall and Ayers heirs in 1898 after incorporating his firm as the Burlington Malting Co. After building another malt house on Wilmot Avenue – now South Pine Street – in 1900 (that building was destroyed in a 1902 fire), Petrie’s company sold the malt house and property on Main Street to Burlington’s Finke-Uhen Brewing Co., which continued the malting business. In 1900 Finke-Uhen added two stories to the malt house and enlarged the engine room, and in 1901 it built another addition. Finke-Uhen’s malting business, which was strong for several years thereafter, declined with the onset of Prohibition in the late ‘teens. In 1933, about the time Prohibition ended, the Old Dutch Brewing Co. of Milwaukee bought the malt house and property and started alterations to the buildings, but ran into financial difficulties. A year later, the property and buildings were sold at a sheriff’s sale to the lien holders, which included the Wilbur Lumber Co., Reineman Hardware, and Kruckman and Glaser Hardware. In 1943, the property and buildings were sold again, this time by Racine County to the Haylofters for delinquent taxes. 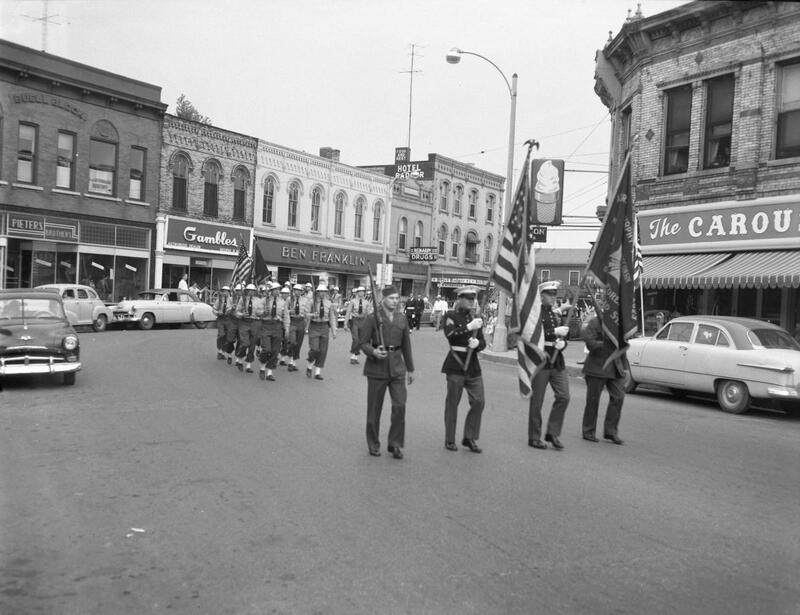 The Anderson-Murphy VFW Post’s marching unit (left) comes around the Chestnut Street bend during Burlington’s 1953 Memorial Day parade in the Then photo from the Burlington Historical Society’s collection of Free Press negatives donated by the late Elmer Ebert. Carrying the VFW Post’s flag is Marine veteran Robert Boulden. The late Harvey Uhen, also a Marine veteran, is at left carrying the rifle. 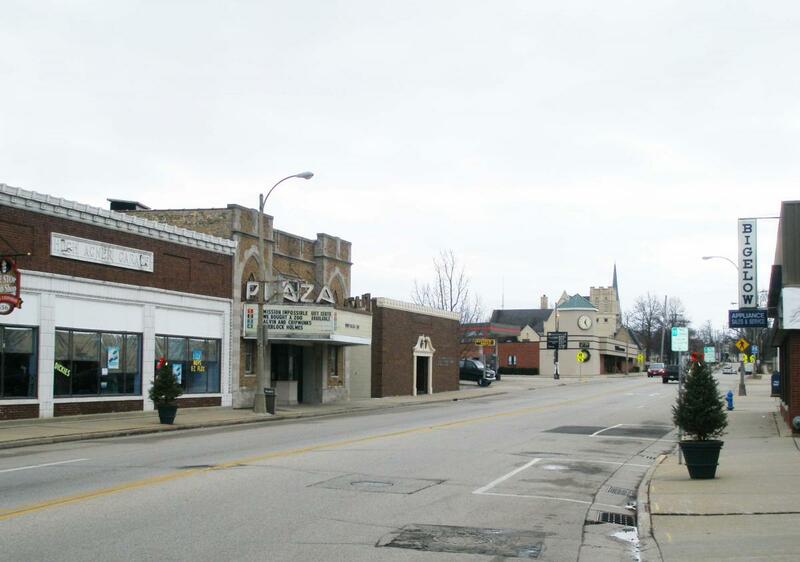 The 1953 occupants of the buildings shown on the south side of Chestnut Street – Pieters Brothers, Gambles, Ben Franklin, Reinardy Drugs, and Hotel Badger – are all familiar names to long-time Burlington area residents. Except for the Hotel Badger building, whose top two floors were removed after an October 1968 fire, the upper stories of the buildings shown in the Now photo taken in March 2012, look remarkably the same as they did in 1953. In the interim, however, some of the building fronts changed looks before being restored to their earlier appearance. The “Buell Block,” which housed Pieters Brothers department store in 1953, was built in 1895 after a fire had destroyed the previous building, which had been put up in 1885. At the time of the fire, the building housed Charles G. Foltz’s dry goods store, Frederic J. Buell’s hardware store, and Edward E. Mills’ law office. After the fire, Foltz leased the entire first floor and part of the second floor of the new building and Buell moved his hardware store to another location. After the Foltz store closed in 1927, twin brothers, Albert J. and Joseph W. Pieters, leased the building for their department store. The Pieters’ store remained in the building until December 1965, when it went out of business. Barton A. Gleeson then bought the building and opened Barton’s department store in 1966. At that time, the front facade of the building was covered with a false front, including a shingled canopy. After Barton’s closed in 1985, the building was remodeled and renamed “The Loop.” Since then, a variety of businesses have occupied the building at various times, including food and confectionery shops, gift shops, a tanning center, an antique dealer, a computer store, an insurance agency, a pet store, a bridal shop, a beauty salon, WIN-TV, a floral shop, and the Chamber of Commerce. Occupants at the time of the 2012 photo included Delights gift and confectionery shop; Gia Bella flower and gift shop; Richard Van Hoesen, CPA; Stitch Shoppe; and Massages by Nikki. The building that housed Gambles in 1953 is occupied today by The Shy Violet antique shop, which opened there in 1998. In the intervening years, the building housed such businesses as the Rueter & Hannas men’s clothing store, Barton’s men’s store, and the Rustic Hut antique shop. The building was put up in 1868 by Charles J. Jones and, before Gambles (which sold hardware, auto parts, and other products) moved there in 1939, had been occupied by a series of drug stores, including those of Dr. Joel H. Cooper, Charles Woods, Martin and Frank Prasch, and Simeon M. Reinardy. The double-store building that housed the Ben Franklin variety store in 1953 was also built in 1868 by Charles J. Jones. The first occupant was Jacob Crane’s “The Bee Hive,” which sold dry goods, clothing, groceries, crockery, furs, and other products. The First National Bank, which became the Bank of Burlington, occupied the west half of the building from 1872 until 1909. Crane operated his store until 1881 when he moved to Chicago. Subsequent occupants included Leonard Smith and Matthew Cunningham’s dry goods and clothing store, Pieters Brothers, the Universal (later Kroger’s) grocery store, Johnson and Rittman’s clothing store, and Rueter & Hannas clothing store. After Kroger’s and Rueter & Hannas moved to other locations in 1943, the wall between the two halves of the building was removed and Ben Franklin leased the building. During the Ben Franklin tenancy, a false front was put on the upper story. After the Ben Franklin store went out of business in 1985, the store was occupied by a women’s clothing store, a Goodwill store, a souvenir shop, J Roberts men’s apparel, and Eagle Vision. During that time, the false front was removed. Occupants of the building at the time of the 2012 photo were the Chamber of Commerce and Burlington Menswear. The building that housed Reinardy’s drug store in 1953 was put up in 1874 by Charles J. Jones. The first tenants were Charles Wells, who had a jewelry business, and his wife, Delia, who had a millinery business. They were followed by a couple of clothing stores, and in 1883, by Joseph Jackson’s boot and shoe store. After Jackson moved out in 1896, a succession of millinery stores, owned by Mrs. Mary K. Wilson, Mrs. Arlina DeLaplain, Effie and Martina Wiemer, and Nancy and Mary Cunningham, occupied the building. After the Cunninghams moved their hat shop to a new location in 1939, Simeon and Francis Reinardy moved their drug store into the building, where it remained until closing in 1980. Beryl and Joanne Bishop then opened Gingham Dog Antiques, which occupied the building for many years. The occupant in 2012 was MPC Property Management. Four men stand in front of the Burlington Post Office just east of the bend on the north side of Chestnut Street in the circa 1904 “Then” photo (left) developed from a glass plate negative that the late Henry Mangold found in the attic of his home and donated to the Burlington Historical Society. Many of the architectural features seen on the second stories of the center and left buildings in the “Then” photo are still seen today, as shown in the “Now” photo taken in January 2012. The first floors of the two buildings and the facade of the building on the right, however, are markedly different today than they were at the time of the earlier photo. The two-story white brick and stone building that housed the Post Office (together with the adjoining stairway) was erected by Joseph Hoch in 1889 replacing a wooden store building that had stood there since at least 1860. The first tenant in the new building’s first floor was N. Fine & Co., merchant tailors. The firm did not last long, going bankrupt a few months later. In June 1891 William Colby, founding editor and publisher of the Burlington Free Press, was appointed as Burlington’s postmaster. He leased the first floor of the Hoch building and moved the Post Office there in July. He also moved the Free Press office to the basement, where it remained until 1896. The Post Office was in the Hoch building until 1908, when it was moved to larger quarters in the building on the northeast corner of Pine and Washington Streets, where Thrivent Financial is now located. More room was needed because free city mail delivery began in Burlington in 1908. Before that time, city patrons picked up their mail at the Post Office. After the Post Office was moved out, the Hoch building (which has had several subsequent owners) was home to a number of businesses over the years, including T. G. Buchan’s Burlington Drug Co., Charles Jackson’s Drug Store, the Carousel (which sold a frozen dairy product called Penguin), Jack Miller’s Jewelry Store, Jane’s Country House Antiques, Chocolate City Souvenirs, HandCrafted Gallery II, and Liv 4 U fitness and nutrition. The latest occupant, B.S.T.R., had not yet opened at the time of the January 2012 photo. The brick building at the left in both photos was built in 1872 to house the People’s State Bank. It replaced a wooden building which had been used as a restaurant and which was moved to Geneva Street (now Milwaukee Avenue) to become Nicholas May’s meat market. After the bank went out of business in 1880, the property was acquired at auction by former Congressman John Fox Potter, who had taught school and practiced law in Burlington before the Civil War. Judge Potter leased the first floor to the Burlington Post Office, which moved there in 1881. The village’s small telephone office was also in the Post Office from 1884 to 1887. The Post Office remained in the building until 1891 when, as noted above, it was moved to the Hoch building. After the Post Office moved out, Henry Miller bought the building and had the first floor fitted up for his son, Joseph Miller, as a barber shop. 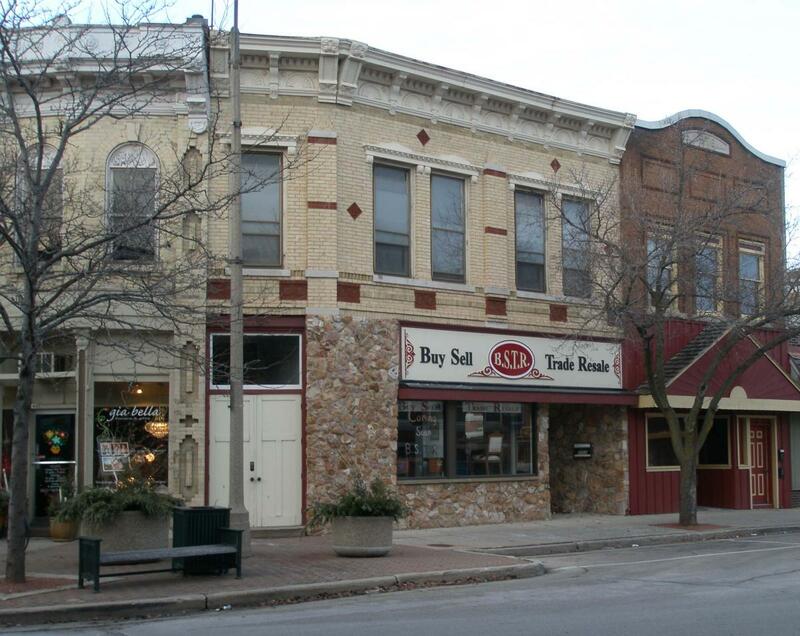 In 1899, Joseph Miller moved the barber shop to the basement and rented the first floor to tailor John Haitz. Haitz remained there until 1902, when George Denniston leased the first floor and opened a book and stationery store, which occupied the building at the time of the “Then” photo. The basement barber shop, marked by the large barber pole topped by the “Baths” sign, was operated at that time by Charles Teut and Cady Farmer. Subsequent occupants of the first floor included piano and music stores; men=s clothing stores; a cigar and tobacco store; several shoe stores, including Verick’s Shoe Store from 1923 to 1939; Swenson’s Jewelry Store; B & B Coins; Gifts by Marcie; Burlington Chamber of Commerce; Burlington Central Model Railroading; sports cards and collectibles stores; and Artisan Taxidermy. The current occupant is Gia Bella Flowers and Gifts. The first floor of the building on the right, known for many years as the Smith building, was occupied by S. M. “Sim” Reinardy’s Union Drug Store at the time of the “Then” photo. After Reinardy bought a drug store across the street in 1910 and moved out, Fred Oberg opened a confectionery store called “Palace of Sweets” in the Smith building. That was followed from 1916 to 1947 by a series of eating establishments, including those of Clarence Partee, William Parkins, Sam Jarvis, Floyd and Charles Dunham, August Huening, and William Pieh. In 1947 Charles B. “Ceb” McCanna opened The Sport Mart, which McCanna and then Carl Rubach operated until 1961. Among the businesses that occupied the first floor since then were Pic Shoe Outlet, The Little Red Schoolhouse, Flames ’n Things, Off the Record, Absolu Salon, The Way We Were consignment shop, Fat Daddyz Tats & Piercing, and Eastside Emporium Tobacco and Trade Co. The first floor store was vacant at the time of the “Now” photo. A horse-drawn sleigh (left) heads up the northwest side of Geneva Street (now Milwaukee Avenue) in February 1936 in a “snapshot” photo found in Roman “Romie” Erdman’s scrapbook at the Burlington Historical Society Museum. At that time, Erdman and his wife, Alma, owned the Old Town Pump’s Handle restaurant and the Old Town Pump sidewalk refreshment stand on the northwest side of Geneva Street near the Chestnut Street corner. January and February of 1936 constituted one of the coldest and snowiest periods Burlington had experienced in its recorded history. The city saw 24.8 inches of snow in January, and February added 23.8 inches more. Between January 1 and February 20, there were 28 days of subzero temperatures. At one point in early February, automobile traffic was halted for two days; and about a week later, another major snowstorm blocked all highways to Burlington and closed the interurban electric railway and the Soo Line and Milwaukee Road railroads for hours. The extreme cold and blizzard on January 22 caused 28 guests invited to the George Wagner - Helen Ehlen wedding reception at the Frank Ehlen farm to stay all night. The weather also caused near tragedy the same day when 29 guests at the Carl Robers - Marie Kornhoff wedding suffered severe frost bite and exposure trying to get to the reception at the Louis Kornhoff farm house. Those guests also stayed the night at the Kornhoff farm. The Buick garage building (notice the sidewalk gasoline pumps) and the since-remodeled Plaza Theatre shown opposite the sleigh in the 1936 photo are still familiar to Burlington residents and visitors, as shown in the Now photo taken January 1, 2012. The small six-window building next to the theatre and the neighboring house in the 1936 photo are no longer there. The small building, then a diner called The Lunch Box, was moved up Geneva Street in 1945 to the front of the Charles Wilson residence on the Hillside where it also served as a diner, operated for varying periods by George and Nick Hancock, Anna Fleming, and Leslie and Marian Pirk. 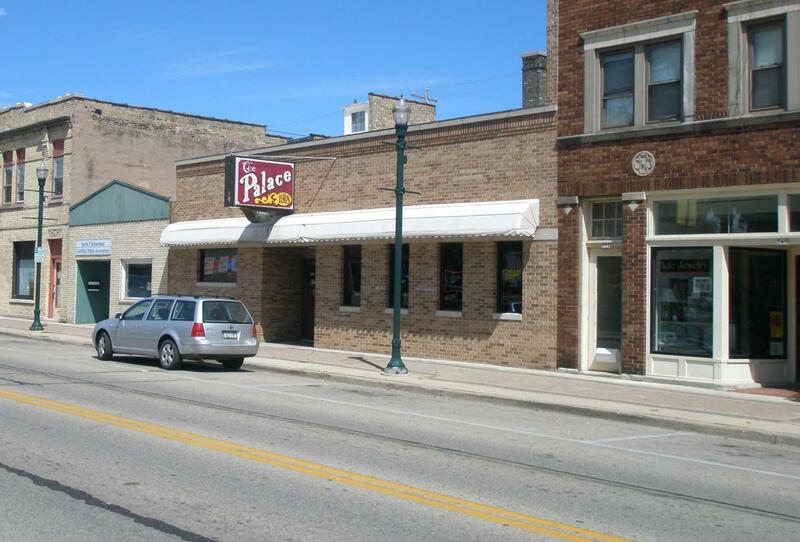 (The former diner building can still be seen next to Ketter’s Flooring.) The house in the 1936 photo was purchased by Gerhard and Anna Verhalen in 1882 from the Simon Kumpf estate. It was being used in 1936 as a rooming house by Badger Hotel owner Fred Oberg. The house was demolished in 1949 to make way for a Kroger grocery store building. In 2012, that building, much remodeled, was the office of the Lloyd Phenicie Lynch Kelly Hotvedt & Terry law firm. The garage building, occupied by the Cunningham Buick Co. at the time of the 1936 photo, was erected by Hugh Agner in 1916 for his Studebaker dealership. After the Agner firm moved across the street in 1927, other automobile dealers, including Gerling Nash Co. and Union Chevrolet, occupied the building until October 1933, when John and Arthur Cunningham moved their Buick dealership there. Cunningham Buick remained in the Agner building until 1947 when it moved to a new building on Jefferson Street. After the Cunningham dealership moved out, the Agner building was occupied by a succession of Ford dealerships, including those of Alfred Bramucci, Norman Bakke, and Alvin Rommel and E. W. “Bill” Shallock. Since 1970, when Shallock moved his Ford dealership to a new building on Highway 36 North, the Agner building has been home to such businesses as the Burlington Discount Center, the Burlington Family Center, Bob’s Pedal Pusher, Focus Hair and Body Concepts, Dolce Diva women’s store, Closet 2 Closet, and The One Stop Scrub Shop. The Plaza Theatre (now spelled Theater), built by Fred Oberg and Olaf Hoganson, opened in February 1928. It has had a succession of owners and operators since then. The theater has been upgraded with improved equipment and seating over the years, and in 1997 three screens were added. Today, the four-screen Plaza is owned and operated by Shad Branen. After a fire on October 18, 1984, gutted the building housing The Palace Restaurant and Bowling Alleys, shown at left in a 1952 Free Press photo, the remaining parts of the building were demolished and replaced with the building shown in the photo at right taken in August 2011. The re-built Palace began serving customers again in August 1985. The shorter building to the left, or north, of the Palace, which housed Soetenga Sales and Service at the time of the 1952 photo, also suffered a fire – in 1963, when it was occupied by Andrew’s Studio, a photography business. The office of certified public accountant Kevin Schuerman is currently at that location. In the late 1800s and early 1900s, a large stone building housing three stores had occupied the lots. (See inset in 1952 photo.) During those years, various businesses were in the three stores. The left, or north, store (occupied by Soetenga in 1952) was used as the town hall until 1889 when the building to its left, now housing Trend Setters, was built as the town and village hall. From 1889 on, the north store housed such businesses as the meat markets of Richard and Reinhold Weyrough, William Rossmiller, DeWitt Stanton and Ernest Wright, Albert Kettlehut, William Cook, George Henry, Vern Dibble, Michael Fleuker, William Willich, and Michael May; the flour and feed stores of Ben Muegler, Ernest McLaughlin, and George Fratt; William Frook’s fruit and vegetable market; an auto parts store; a yarn shop; Partee Electric Co.; an appliance store; a lunch counter; an ice cream shop; and the Glenayre feed store. Following Soetenga, businesses in the building included the Record Nook, Jack and Jill Studio, and Andrew's Studio. Following the 1963 fire, businesses at that location included Plymouth Loan Co., Family Finance Corp., Robert Mogenson’s law office, Max Hintz’s chiropractic office, Baker Hobbick Properties, Terra Staffing Services, and Schuerman’s CPA office. The large stone building’s center and south stores, which eventually became the Palace, were occupied in the late 1800s and early 1900s by a variety of businesses, including Edward Rakow’s tailor shop and Gotfried “Fred” Leber’s boot and shoe shop; William Ohlendorf and L. H. Blakeman’s marble and granite works; the laundries of Charlie Lee, George Goodwin, and Mrs. John Elting and William Volkmann; Joseph Reuschlein’s book, toy, and notion store; Louis Jacobs’ barber shop; and Albert Tichlofen and Albert “Ollie” Leber’s cigar factory. When Henry Siehoff bought the center and south stores in 1915 from Edward Rakow and Mrs. Lena Ohlendorf, he had Joseph A. Rueter and his men put a new brick front on the buildings and extend the south building back to the alley. When the remodeling was finished, Isaac Cohen rented the left portion for his tailor shop and Tichlofen and Leber moved their cigar factory upstairs and opened a bowling alley, called the White Stag, in the right portion. When the bowling alley closed for the summer season in June 1916, two additional alleys and “automatic” pin setters were installed. During the summers, the front part of the building would be converted into an ice cream parlor. Tichlofen eventually opened a billiard room in the left portion where Cohen’s tailor shop had been and renamed his businesses the Palace Bowling Alleys, Billiard and Ice Cream Parlors, and then the Palace Recreation Rooms. In 1927 Tichlofen sold the Palace Recreation Rooms to former major league baseball player, Robert “Bob” Steele. Subsequent owners included William Uglow, Tommy Croake, and Allen Castleberg and Francis Sommers. 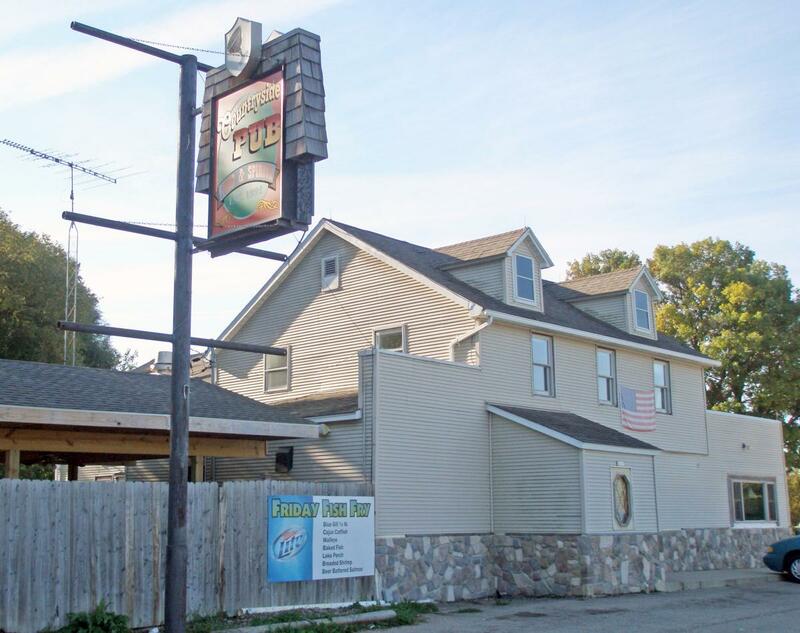 Castleberg, who bought the business in 1945, converted the pool hall into a restaurant in 1946. William “Gabby” Corbett and Nesbit “Nick” Hancock bought the business in 1952. Subsequent proprietors have included Robert Corbett; Richard and Carol Corbett; James Walsh and Robert Watson; and David and Sandy Corbett, who opened Gabby’s Palace in 1992. 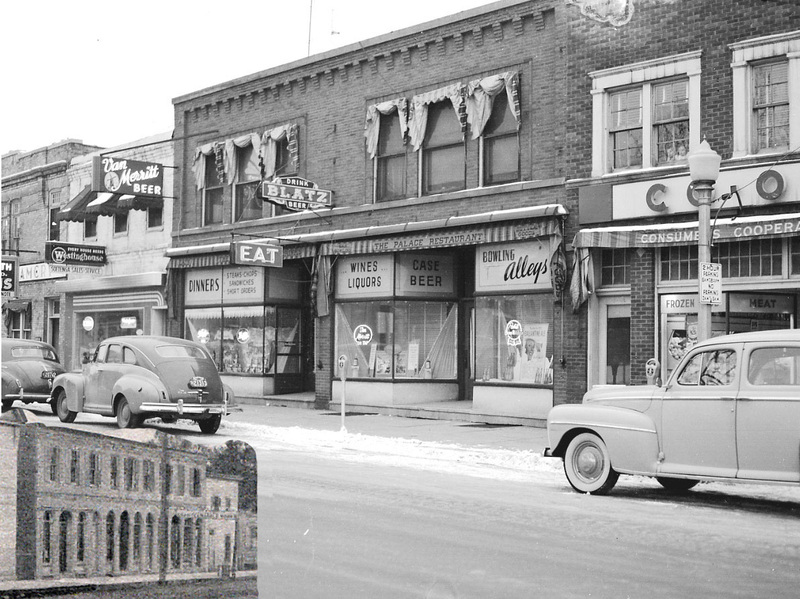 The brick building at the right, occupied by Consumers Cooperative (Co-op) grocery at the time of the 1952 photo, has been occupied since 2000 by Ide Fine Jewelry. The building was erected in 1924 by cigar-maker Theodore “Ted” Huening after a frame building (seen in the inset), which had served as a residence and cigar factory, was razed. When the brick building was completed, Huening operated his cigar factory on the second floor and rented out the first floor to a succession of businesses, including the Co-op grocery, which operated from 1940 to 1956. 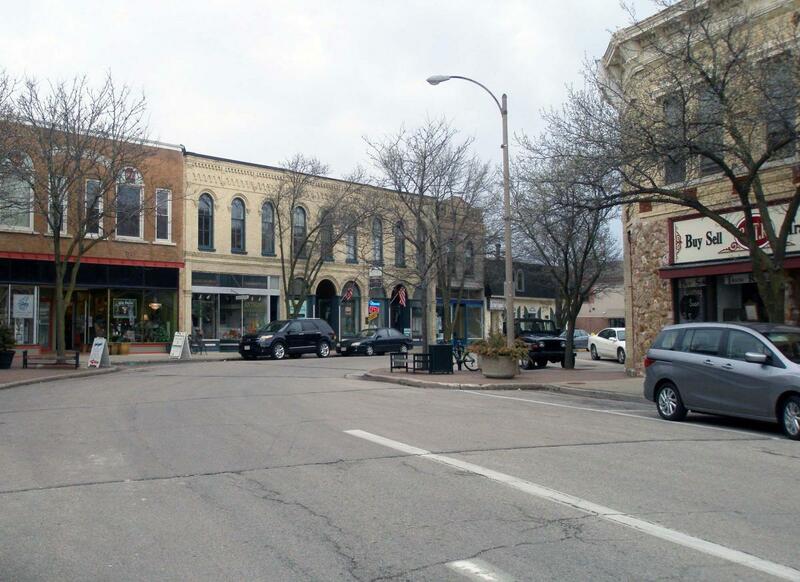 Other businesses there over the years included Nevin’s grocery store, a ladies apparel shop, an awning and upholstery shop, Swenson’s jewelry store, Soetenga’s electrical sales and service store, Wilfred Ringer’s R & G Appliance store, a ceramics shop, and a crafts shop.